If you want to learn more about 3D printing, whether you’re hunting for some solid tips to just get better prints, or to get full step by step technical training to gain expert insights, you’re in the right place. The aim of this article is to get you on the right learning path early, to avoid investing your time or money into a technical 3D printer training course that isn’t the right fit for you. In this review, we’ll compare the most effective options available to learn about 3D printing. This comparison is aimed at a beginner who clearly already knows what a 3D printer is, and has either purchased one already, is looking to shortly or likely to be using one soon. 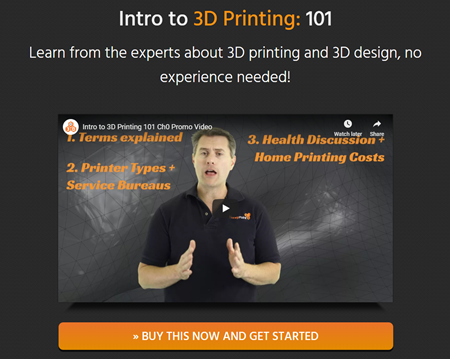 Whether your goal is to learn the complete ins and outs of 3D printing for home use or to advance your knowledge for professional reasons, the range of 3D printing tutorial and courses listed here will assist with that. If you’ve some experience using a 3D printer already, you’ll be aware that it can be a daunting experience. Where do you even start? First, you need to know how to choose an existing design to print, where to get good files, or even design your own using software. You need to figure out what printer you’re looking to buy or where to use one. Then you need to know how to operate it correctly so you can get good results. "Trial and error can work, but this takes time and you need a certain level of knowledge to know what definitely doesn't cause the fault to weed out potential causes." Finally it really pays to expand your knowledge so you can master fine tuning the process to getting truly exceptional prints, predictably (and know what to tweak when you don’t). Learning all the steps in a methodical manner will save a lot of hassle. Sure you can just try it, and go through trial and error, but without guidance to follow; this can be a painful, lonely route. And then there’s the troubleshooting aspect – understanding what causes certain issues, and how to correct them. This is something you can really only learn from experience. Whether you choose to learn from your own experience (potentially years figuring it out on your own), or a seasoned expert, is up to you. We’ll also break down the various ways to learn and the pros and cons of each - make sure you invest in the learning style that suits you. Do you prefer to read a book, some tutorials, easy to follow videos, an online 3D printing course or even college or university lessons? Let’s take a look at our preferred options for you to master 3D printing for each route. We’ll start with the most unassumingly obvious – a good book. Don’t worry, we’ll be brief here but we just wanted to address these options. A word of warning; be careful you don’t just end up with a big 'general' book, they might cover nearly every aspect of printing in some detail, but if you're looking for solid learn how to use a 3d printer step by step, they're often not detailed enough. 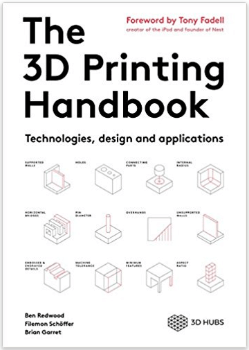 While you might not read a book like this cover to cover, preferring to learn from a more easily digestible video format perhaps – they may make good reference guides if you choose to take a 3D printing course online. This is a fantastic overview, and a bit of a classic. 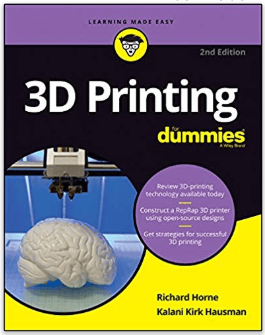 The recognised 'for Dummies' format, co-written by a true expert in 3D printing, Richard Horne. Whose well regarded as the 'father of Reprap' (Reprap printers can replicate, or print all their plastic parts themselves). It's an ideal book if you'd like the basics on just how do you use a 3D printer and virtually all aspects of printing. However, due to it's wide scope (it touches on almost every aspect of 3D printing), it's doesn't cover specific topics in huge depth - so it's less of an advanced technical tutorial on 3D printing techniques. It makes for an excellent introduction, though. book - virtually every technology relating to 3D printing is covered in here. It also nicely explains most design concepts relating to 3D design, and touches on the more advanced high-end industry machines. Fantastic as a reference book, but don't expect to finish it being able to actually use it to fully grasp, troubleshoot and improve your prints with a 3D printer. To get the most from a 3D printing Tutorial you’re best looking for topics that are extremely specific, so that the tutorial can cover enough on that single aspect to be valuable. Many general 3D printer tutorials are too vague to provide real value to anyone beyond just understanding what a printer can actually do. Despite this, here are some tutorials available that we like. You'll have to bridge the gaps between them yourself, but for free content that is detailed, they're hard to beat. It's worth noting that this isn't a specific how-to guide of any kind, purely good as a demo video to explain various types of 3D printers and how they work. It's proved popular on YouTube, and would serve a great job if you needed to quickly give someone without any prior knowledge a good overview of what 3D printing is. It also lightly delves into a few common 3D printer faults, and best practices for resolving and printing parts, including best practices. Quite comprehensive for an 11 minute video. 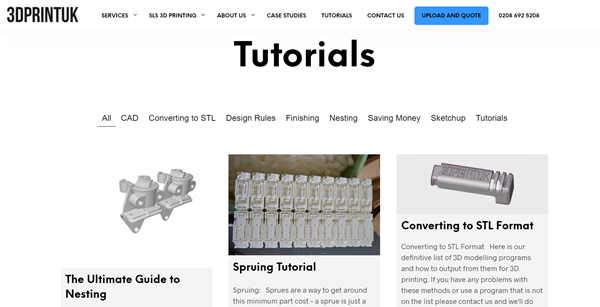 These guys know a thing or two about 3D printing and provide specifically good advice to anyone looking to get their designs 3D printed by a 3rd party, or needing entry level batch production runs of their parts. Good mix of pre-manufacturing tutorials, such as nesting and spurling. They also cover saving tips, like how to minimise printing time and cost when using a service to print your design files. It looks roughly like an Airbus A380, although the design isn't official - and admittedly would look great on your desk or as one of your first prints, to show off the printer. This is probably the most technically exact and complete guide here, as it considers the actual settings you need for a specific print. While the project can still be printed on smaller printers, they’ll likely be a loss of detail. Don't expect detailed troubleshooting advice or any methodology explained behind the work though, it's more of a 'click here', and 'do this' walkthrough. course local to you, but does it cover your requirements in enough detail? • Schedule – in-person learning is structured outside of your control. Do you need to learn at your own pace, fitting it around your life. Rather than the other way around? • Cost – Physically attended events are typically more expensive. For an in-depth course or workshop you can be looking to pay $300-$2000. Beware of cheaper or free courses, these are usually designed to get you “in the door” before they pitch a more expensive product to you. • Followup – Does the course you’re looking for cover feedback on your work? Some online (or even the physical) courses may just be “static”, once you’ve finished, you’re out the door and you can’t ask any questions. Often the most effective way to learn is to absorb the content, and then practice with tight feedback cycles from someone experienced. Can the 3D printing training you’re looking at offer this? While we can't provide a complete list of physical location courses (for a start, we don't know where you're based! ), here are some online course options that may work for you if there's nothing comprehensive enough in your local area. This course has a big name behind it: Microsoft. It's completely free, although we find the interface a little tricky to navigate and the constant ads can be distracting. It covers some good points on troubleshooting and of course an introduction to the technology. We like how they've clearly gone for a high production value and a relaxed 'chat show' like format. It may leave you wanting more depth of coverage for the technical aspects though, and there's no way to follow up the presenters with any questions relating to the content. 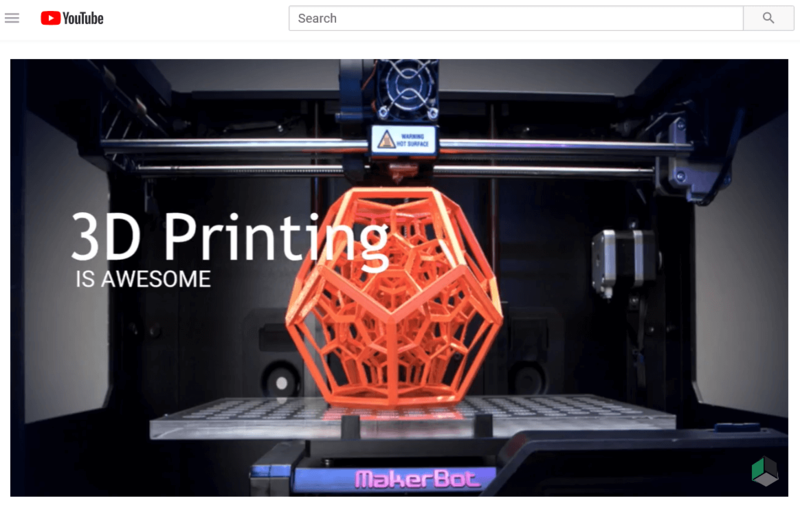 If you're beginning to exhaust all the free options to learn about 3D printing and are willing to make a small investment, Nick Kloski's course is just $29.99. He covers history of 3D printing, along with brief design software introductions along with technical aspects such as best operating systems to 3D print from. There's little on actual 3D printing troubleshooting, setup etc. 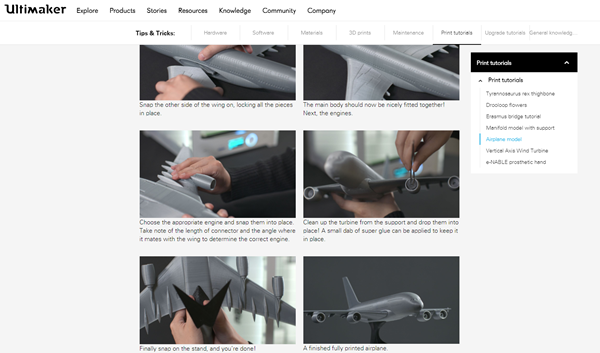 - its more from the angle of demoing different uses of software used in 3D printing. Good as an introduction from a complete unknown perspective. 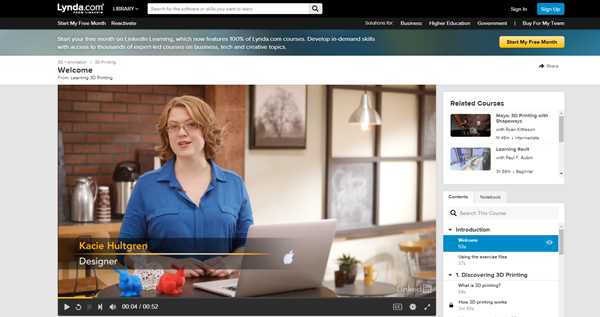 Lynda have a small selection of short 3D printer courses. This one in particular is a little over an hour. You can get access to these and similar courses on almost any topic for about $30 per month. This course covers some theory, but more of a brief general overview and walkthrough on all things, software, examples of what can be made, some design considerations and comparing different 3D technologies. Again, it's hard to cover any specific topic in solid depth in just an hour, but if you're looking to learn a bit on a range of other non-3D printing related topics, the subscription may well be worth it. Probably one of the best free courses, because it’s taught by someone with solid 3D printing experience; however as with most free online courses it is short. Therefore gives an excellent amount of good advice for the price (FREE) but falls short of a comprehensive course as it comprises of just 4 brief lessons. What you save in money, may be easily made up for with time spent searching for answers to your questions that aren't covered. A short course may in some instances simply create more unanswered questions. So as with anything, it's worth considering exactly what you want to get from a course before you invest your time into it. If you've made the clear decision and are prepared to make the commitment to learning in an in-person environment, then check out your local collages. 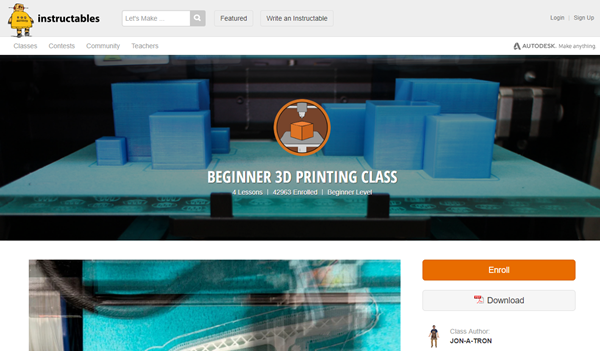 Many will offer some kind of 3D printing course, some may include certificates. Image above a course local to us. While collages are certainly respectable and their academic authority well established, ensure the course instructor is well respected and the content has been designed from a practical, experience-lead angle. Local collages can often be the cheapest way to do a hands-on course. Typical courses are around 90.00GBP - 295.00GBP. Be prepared to adhere to a consistent time frame schedule, as you may not be able to learn at own pace. Technology course? Few have a more prestigious name than the Massachusetts Institute of Technology. This is a 12 week part-time course aimed at those serious to learn all aspects of practical 3D printing, for $1950 USD. 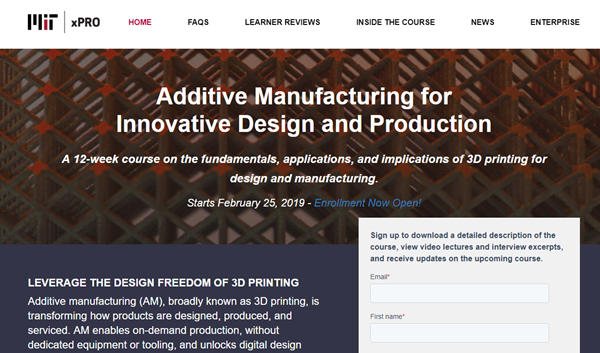 This is the most comprehensive course covered here by a significant margin and by all accounts gives students an very well rounded foundation on 3D printing, including design considerations. If you're serious about learning, then you could do worse than this well designed, well respected course. However, at nearly $2000 while it's still cheaper than a University degree, it's perhaps more geared to those who can convince their employer to foot the bill from a commercial standpoint. If you're looking for serious training to learn how to use a 3D printer, then you may be interested in our video course we're launching soon: The Complete, Confusion-Free Guide to 3D Printing Mastery. We've pulled out all the stops to take you through the exact setup procedures, methodology and advanced troubleshooting techniques we've used to coach thousands of customers to 3D printing perfection.